Photo: The Mayor and Mayoress, Councillors Dave and Jeanette Banks, with Library Service Development Manager Kathryn Boothroyd and Central Library and Archives Manager Bill Renshaw. 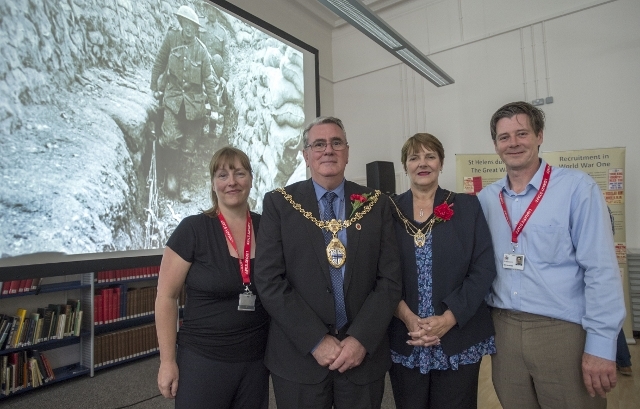 More than 100 people arrived at Central Library for two special screenings of The Battle of the Somme – one of the most watched films in British cinema history. The film, which had its premiere in London on 10 August 1916, depicts the British Army in the early days of the famous battle. It was seen by around 20 million people in Britain within six weeks of its release. As part of the events marking the battle’s centenary – and the ongoing First World War centenary commemorations – The Imperial War Museum and the First World War Centenary Partnership loaned a copy of the film to the St Helens Library Service. The Mayor and Mayoress of St Helens, Councillors Dave and Jeanette Banks, attended one of the screenings, while students from Cowley International College and St Augustine of Canterbury Catholic High School also saw the film.